Although PIM is intra-domain multicast routing protocol, RPF check is always performed based on IGP, in our case OSPF. 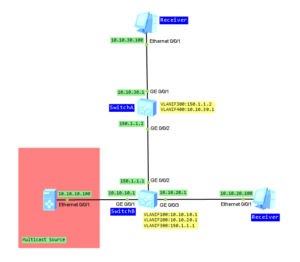 Every problem in OSPF causes a problem in the multicast. As you can see from the above output, except PIM DM protocol, IGMP has been configured at the interfaces towards receivers. What is IGMP? This is Internet Group Management Protocol that manages IPv4 multicast members. In short, IGMP needs to be enabled on hosts and on switches. Through IGMP, a multicast L3 device knows whether there is a multicast group member, on the network segment to which an interface of the switch is connected. Let’s start multicast source. Assume that receivers need to get information about multicast group G 225.1.1.1. When sending multicast packets to multicast group G, multicast source S 10.10.10.100 generates an SPT (shortest-path tree) through flooding and the (S, G) entries exist on both switches that are in the SPT. When a receiver joins multicast group G, an (*, G) entry is generated on the switch. Let’s check whether it works, using eNSP with VLC.